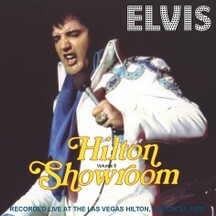 AudiRec proudly presents: ELVIS – HILTON SHOWROOM VOLUME 5 – a brandnew CD. It includes an audience recording of the complete and so far unreleased performance from March 27, 1975 (Dinner Show) at the Las Vegas Hilton Hotel. Expect another dynamic Elvis performance from a time period when Elvis was willing to “deliver”! Here we go with probably the last known recording of a March 75 Elvis Vegas-Show in pretty good, listenable sound. From the reports we have on hand (mainly from our personal archives of original “Elvis News Service Weekly” magazines) it shows that Elvis did just great since the engagement started on March 18. Forrest Duke from the “Las Vegas review Journal” commented “Hilton´s Elvis stronger than ever” and pointed out some new titles in Elvis´ setlist. Even Glen D. Hardin´s Aunt Ann Cummings attended the shows around March 27 and commented positively “Elvis his old self again”. Well, since you are soon able to own the complete performance on CD just judge yourself! It´s Las Vegas! It´s the Hilton Hotel Showroom! It´s ELVIS! Enjoy!